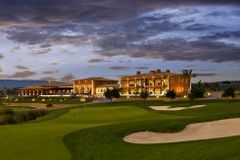 Son Gual is the newest and most desirable name on Mallorca's golfing map, having opened in October 2007 to much acclaim. Located just west of Palma, and not far from the airport, Son Gual is ideally positioned for access from the majority of the island's most popular hotels and resorts. German designer Thomas Himmel is the man responsible for the majestic par-72 layout at Son Gual, which is already renowned for its impeccable conditioning. Son Gual is one of a collection of new championship courses that is a must play for serious golfers; although it is more expensive than most others in Mallorca, the challenge and overall experience of Son Gual is well worth it. To underline the quality of the layout, Son Gual is among the newest additions to the Your Golf Travel.com Top 100 European Courses - in fact, it has jumped straight into our top 20! Be sure to test it out for yourself on your next golf holiday in Mallorca. The whole facilities at this course are superb, however, with some of our Society members being well into double figure handicaps was generally too difficult for our group. Unfortunately we will not elect to play this course next year. Play off the whites. The best course in the island.